Posted in featured, GCPI, General Company of Iraqi Ports, Gulftainer, Iraq Container Terminal (ICT), Iraq Industry & Trade News, Iraq Transportation News, mn, Ports, Umm Qasr, Umm Qasr Port, United Arab Emirates (UAE). IBBC recently completed a productive mission to Baghdad, meeting with high-level government officials and British authorities in Iraq. 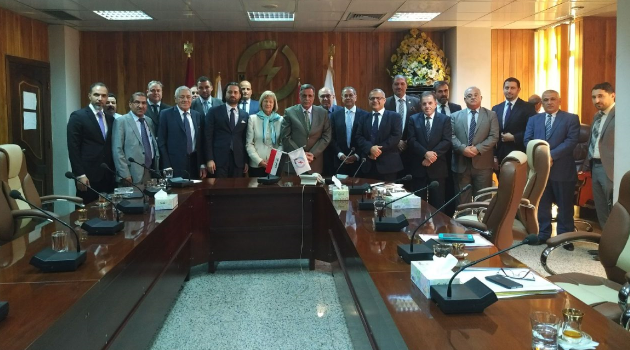 Baroness Nicholson of Winterbourne, President of IBBC and the Prime Minister’s Trade Envoy to Iraq led the delegation alongside Mr Rasmi Al Jabri, Deputy Chairman of IBBC, Mr Christophe Michels, Managing Director of IBBC and Mr Vikas Handa, IBBC representative in the GCC. IBBC was joined by numerous member representatives, including from Al Bilal Group, Al Burhan Group, Al-Nukhba OFS, ARCHS, Constellis, Dar Group, EY, Gulftainer, G4S, Khudairi Group, International Islamic Bank, Kuwait Energy, Management Partners, Menzies Aviation, Mosul University, National Bank of Iraq, Ratba’a Contracting, Serco, Shell, Standard Chartered Bank and Turnkey LLC. The delegation visited soon after the election of President Dr Barham Salih, who took time out of his busy schedule to meet Baroness Nicholson and the IBBC leadership who were joined by HMA Jon Wilks. Dr Salih has been a close friend of the IBBC for many years and recently spoke at the IBBC Cumberland Lodge Conference in July. On Sunday 7 October the delegation held meetings with the Governor of the Central Bank of Iraq, Mr Ali Mohsen Ismael Al Alaq, H.E. Mr Adbuallah Luabea the Deputy Minister of Transport, Mr Fayadh Neema, Senior Deputy Minister of Oil and Dr Sami Al Araji, Chairman of the National Investment Commission. The delegation were hosted by the Iraqi Federation of Chambers of Commerce in the evening for dinner. On Monday the delegation met with Dr Mehdi Al Alak, Secretary General of the Council of Ministers, Dr Hameed Ahmed Deputy Chairman of the Council of Ministers, Dr Sabah Mushatat, Economic & Investment Advisor to the Prime Minister of Iraq, Dr Mudher Mohammed Saleh, Finance Advisor to the Prime Minister of Iraq and with Ján Kubiš Special Representative of the Secretary-General and Head of the United Nations Assistance Mission for Iraq. In the evening Ambassador Jon Wilks hosted a reception for the delegation and Iraqi dignitaries at his residency. Before leaving Iraq, Christophe Michels visited Serco, who are working with the Iraqi Civil Aviation Authority at Baghdad International Airport. Serco supports the Iraqi authorities in managing the entire spectrum of air traffic control in Iraq including the increasing number of international overflights. Posted in Al Burhan Group, Al Nukhba Oil Field Services, Al Ratba’a Contracting, Albilal Group, ARCHS, baghdad, bank, Banking & Finance, Business, Central bank, Central Bank Iraq, Central Bank of Iraq, Central Bank or Iraq, Economic News, Commission, Constellis, Dar Group, DJ, E&Y, G4S, Gulftainer, International Islamic Bank, Investment, Iraq Britain Business Council (IBBC), Iraq Industry & Trade News, Khudairi, Kuwait Energy, Management Partners, Menzies Aviation, Mosul University, National Bank of Iraq, Serco, Shell, Standard Chartered Bank, trade missions, Turnkey, United Kingdom. Following on from the first Iraq Britain Business Council conference in Dubai in 2016, the IBBC was delighted to host its Autumn Conference in the UAE once again. The event was strongly supported by the UAE authorities. Alongside Baroness Nicholson, the UK Prime Minister’s Trade Envoy to Iraq and President of the IBBC, the conference was opened by H.E. Mr. Abdulla Ahmed Al Saleh, Under Secretary for Foreign Trade and Industry, UAE Ministry of Economy. H.E. Mr. Abdulla reminded delegates that non-Oil & Gas related trade between the UAE and Iraq had already passed 11 Billion USD in 2016, with Dubai in particular being a hub for local and international companies in the region. H.E. Mr. Abdulla firmly believes that the UAE’s role in the rebuilding of Iraq will continue to expand and expressed his wish to cooperate with organisations such as the IBBC to accomplish this crucial task. Vikas Handa, IBBC UAE Representative and the Managing Partner of the Emirati Company DrillTech, warmly thanked the minister and stated that the IBBC stands ready to work even more closely with the UAE in Iraq. 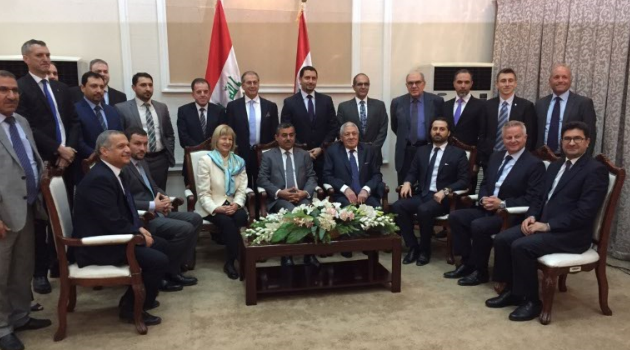 The Government of Iraq sent a high calibre ministerial delegation led by H.E. Mr Qasim Al-Fahdawi, The Minister of Electricity, to the conference. The delegation included H.E. Mrs Ann Naufi Aussi Balbool, Minister of Construction Housing and Public Municipalities; H.E. Kadhim Fijan Al Hamami, Minister of Transport; H.E. Dr Sami Al Araji, Chairman of the National Investment Commission (NIC); and H.E. Mr Fayadh Hassan Nima, Deputy Minister of Oil for refining affairs. The conference was structured around several sessions in which the Iraqi officials and international companies operating successfully in Iraq, most of which are members of the IBBC, exchanged their views and experiences. These sessions focused on strengths, weaknesses and opportunities of the economy in Iraq, Reconstruction & Infrastructure, Transport, Power and Oil & Gas. In parallel, a series of high level round-table discussions between investors and Iraqi Government representatives took place. The conference included for the first time a presentation on the rapidly developing Tech sector in Iraq , given by the CEO of Zain. IBBC thanks the International Finance Corporation (World Bank) and the IMF for its participation. Thanks also go to the IBBC members who sponsored the conference: Gold Sponsor International Islamic Bank; Silver Sponsors Serco and Gulftainer; Lunch Sponsor Rolls-Royce; pre-reception Sponsor Wood; and Coffee Break Sponsors Eversheds Sutherland and KCA Deutag. IBBC Managing Director, Christophe Michels, stated that the increasing involvement of the UAE and wider GCC with Iraq was a game changer for the country. The IBBC very much welcomes this development and is delighted to be part of it and support it. The organisation will increase its presence in the UAE and the Autumn Conference in Dubai will become a regular feature in its calendar of events. Posted in bank, Banking & Finance, Baroness Nicholson, Business, Commission, conferences, Construction & Engineering In Iraq, DrillTech, DUBAI, Eversheds, Eversheds Sutherland, featured, Gulftainer, International Finance Corporation (IFC), International Islamic Bank, International Monetary Fund (IMF), Investment, Iraq Banking & Finance News, Iraq Britain Business Council (IBBC), Iraq Education and Training News, Iraq Industry & Trade News, Iraq Oil & Gas News, KCA Deutag, National Investment Commission (NIC), Rolls-Royce, Serco, United Arab Emirates (UAE), United Kingdom, Wood, World Bank, Zain. Baroness Nicholson of Winterbourne, President of the Iraq Britain Business Council (IBBC) and UK Prime Minister’s Trade Envoy for Iraq, led a delegation of 25 IBBC member company representatives on a Trade Mission to Baghdad organised by IBBC Managing Director, Mr Christophe Michels and IBBC Co-Chairman and Iraq Representative, Mr Rasmi Al-Jabri. Delegates included representatives from Penspen Ltd, Kuwait Energy, Serco, Wood, Ratba’a Contracting Co., Management Partners, Gulftainer, HWH & Associates, Al-Burhan Group, CCC, Dar Group, Restrata, Rolls Royce and new member XReach Ltd. The delegation met with a number of ministers and high ranking officials to discuss future policies and opportunities for growth as well as focusing on business opportunities for IBBC member companies. The above meetings were joined by a number of Director Generals heading up the different departments in the various ministries. On Sunday 29 October, IBBC Member Al Burhan Group, generously invited delegates for dinner at the Al Burhan Centre near the Baghdad International Airport. The delegation was also invited for a Dinner at the British Embassy in Baghdad on Monday 30 October, where members delegates met with Representatives of the Foreign and Commonwealth Office, the Department for International Trade, the World Bank, the EU and the Prime Ministers Advisory Council. Posted in Al Burhan Group, Al Ratba’a Contracting, baghdad, bank, Banking & Finance, Baroness Nicholson, Business, CCC, Committee, Dar Group, DUBAI, featured, Gulftainer, HWH Associates, Investment, Iraq Britain Business Council (IBBC), Iraq Industry & Trade News, Kuwait Energy, Management Partners, Penspen, Restrata, Rolls-Royce, Serco, trade missions, United Kingdom, Wood Group, XReach. Rebuilding Iraq is central to the agenda of the Iraq Britain Business Council (IBBC) autumn conference at The Address, Dubai Marina on 12th November. 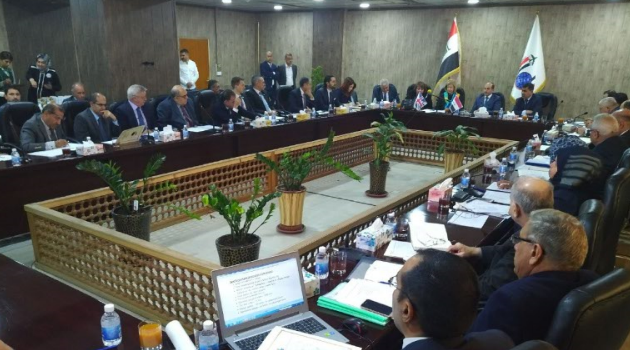 The opportunity for businesses in the region to engage in Iraq is reflected by the attendance of a number of high profile Iraqi Ministers: from Electricity, Transport, Oil, Construction and Housing, to the Governor of Basrah and International financiers, including the IMF and World Bank. “Iraq is the second largest oil producer in OPEC and has one of the biggest programmes for new power generation projects in the region; Iraq presents massive opportunities for housing, Infrastructure and FMCG businesses. The event is designed to discover the opportunities and projects live and intended in Iraq, for business people to meet the decision makers, to obtain insights and to network”. UAE is increasingly seen as the regional hub for corporate operations in Iraq and the place where business decisions are determined. We can confirm this as a range of leading international companies are attending, including GE, Siemens, BP, Wood, Serco, Shell, Petronas, Gulftainer, Zain, KCA Deutag, the International Islamic Bank and more. There will also be plenty of networking and engagement on the sidelines beyond the main stage. The IBBC Dubai conference is also the location for the Governor of Basrah to outline his vision for the future, and it is expected ministers will outline the latest thinking on the evolving situation in Iraq and the opportunities this brings. Posted in bank, Banking & Finance, Basra, BP, Business, conferences, Construction & Engineering In Iraq, DUBAI, featured, GE, Gulftainer, International Islamic Bank, International Monetary Fund (IMF), Investment, Iraq Banking & Finance News, Iraq British Business Council (IBBC), Iraq Industry & Trade News, Iraq Oil & Gas News, KCA Deutag, Petronas, Serco, Shell, Siemens, United Arab Emirates (UAE), United Kingdom, Wood, World Bank, Zain. The largest container vessel to call at an Iraqi port has been unloaded at Gulftainer’s Iraq Container Terminal (ICT) earlier this month. According to TradeArabia, the YM Wealth, owned by Taiwan-based Yang Ming Marine Transport Corporation, discharged and loaded over 2,500 containers. The shipping line shows the 68,616-ton vessel as having been at the port from 1st to 3rd July, en-route to and from Jebel Ali Container Terminal in Dubai. Posted in DUBAI, featured, Gulftainer, Iraq Container Terminal (ICT), Iraq Industry & Trade News, Iraq Transportation News, Ports, shipping, Taiwan, Yang Ming Marine Transport Corporation. One of the big hits at this year’s Iraq Britain Business Council (IBBC) conference was the tech panel (pictured) with four leading Tech companies using tech to deliver their unique services: Zain Telco, launching Zain Cash, Restrata who offer cyber security to the traditional and emergent digital economy, and Gulftainer, the logistics to connect Iraq to the world of commerce and Inevert, a start-up tech investor. Prime is the need to diversify the economy away from reliance on oil and gas. Iraq has plentiful supplies of oil but the price is volatile and the country still needs to find employment for millions of young people. Digitising the economy would not only provide hundreds of thousands of jobs, but connect the economy to the modern world virtually and in reality. A bi-product of tech will enable the rapidly growing young generation, who are numerate and tech friendly, to have engaging jobs and fulfil aspirations, instead of a distractive poverty and extreme ideologies. Secondly, Tech as a transactional mechanism also drives transparency, especially when money is concerned. Tech bypasses corruption: It’s no secret that Mastercard is seen as a benign influence in eradicating fraud and corruption in emerging economies. Likewise, Zain cash now offer online payments via Facebook for entrepreneurs to sell their products and services. Not only does this open up e commerce to millions of naturally entrepreneurial Iraqis, but also to people and markets in the wider region, along with options to pay for advertising and marketing support. All this without the need to pay middle men or bribes. Tech is ‘the agent’ of transparency, for the people and for government. Finally, Tech is an agent of cultural transformation and change – as people engage with each other in social media, collaborate in business, and young people learn from educational programs , as Maeve Walsh of UKs DCMS says, the UK Government conducts swathes of its civic, electoral and societal business via the internet. Likewise Iraq can transform government activity within the country, and ‘Iraq Tech’ can also change external perceptions of the country . What can make this happen? Much of the infrastructure is already in the country through the private sector: Zain telco and its Zain cash wallet- Restrata have the cyber tech to protect businesses and Omar Hussan of Inevert is eyeing opportunities for investment- along with Zain, who also intend building a tech hub in Baghdad. Clearly much more investment is required into the emergent start up economy, and despite availability of the free ‘Google skills,’ the government needs to embrace tech education, infrastructure and online transactions- but the private sector can already see entrepreneurial commerce as the driver of change. With a young and educated population of natural trading entrepreneurs, keen to get on with their lives, it’s only a matter of time before the country leapfrogs less liberal countries in the region. Iraq has been held back for too long, but now could be the time the dynamism of the people, their access to electronic platforms, and relative stability could be the trigger that pivots Iraq into a golden age of tech. Ashley Goodall is a martketing consultant to Iraq Britain Business Council (IBBC). Posted in baghdad, Business, Corruption, featured, Gulftainer, Inevert, Iraq Britain Business Council (IBBC), Iraq Education and Training News, Iraq Industry & Trade News, Restrata, Zain. More than 180 expert speakers and delegates from the UK, Iraq, UAE and abroad gathered in Dubai at The Address Dubai Marina on Sunday 18 December for the Iraq Britain Business Council’s (IBBC) Autumn Conference. Usually held in London, the well-attended conference marked the first time the IBBC has held an event in the UAE, a hub for global and regional companies that operate in the Middle East. The decision to move the Autumn Conference to Dubai has certainly proven to be a good one, with the new location attracting a new audience of business leaders and decision makers based in the region. A record number of delegates from non-member companies registered for the event, including representatives from Mitsubishi, Serco, Rolls-Royce, Capital Bank of Jordan and LUKOIL. They were joined by representatives from IBBC member companies, such as Shell, ExxonMobil, Siemens, GE, Amec Foster Wheeler, GardaWorld, Restrata, Eversheds and more. The conference was supported by H.E. Mr Kadhim Finjan Al-Hamami, Iraq’s Minister of Transport, and Mr Frank Baker OBE, Her Majesty’s Ambassador to Iraq, who jointly opened the event with IBBC President Baroness Nicholson of Winterbourne. The theme of the conference was ‘Doing Business in Iraq’. Delegates heard from Ariel Flores, General Manager of BP (Rumaila Operating Organisation), on operating Rumaila in a $50-barrel world during the first session, ‘The Iraq Oil and Gas Sector in 2016’. He focused particularly on how investing in technology, training and safety is key to Rumaila’s operations. Meanwhile, Marwa Al Nasaa, the International Monetary Fund’s Resident Representative for Iraq delivered an overview of the IMF’s Stand-By Arrangement (SBA), economic developments under the SBA and a forecast of what’s to come. Other headlining speakers included Dennis Flannery of Citibank, Dr Jafar Dhia Jafar of URUK Engineering and Contracting Company LLC., Zeeshan Sheikh of the International Finance Corporation, Salem Jawad Chalabi of Stephenson Horwood Middle East LLP and Jorge Vila of Iraq Middle Market Development Foundation (IMMDF), who addressed the audience from Paris via a Skype link-up. IBBC members also joined panel discussions. Asrar Abdulhussein Mohammed of International Islamic Bank participated in the finance session, while Iain Rawlinson of Gulftainer and Peter Turner of SKA International shared their insights on opportunities in Iraq for investment and partnership within the transport and logistics sectors. Amar Shubar of Management Partners, Gavin Rennie of EY, Afif Masri of PwC and Vikas Handa of Beas LLC (formerly of Weir Group) chaired the panels on finance, power, opportunities in the private sector and O&G respectively. he IBBC Autumn Conference was generously sponsored by the Islamic International Bank, Gulftainer, Weir Group, SKA International and the IMMDF. The IBBC’s next conference will take place at Mansion House, London, on Monday 3 April 2017. More information will be available in due course. For information on the IBBC Autumn Conference, membership or conference sponsorship opportunities, contact the IBBC London team at london@webuildiraq.org or +44 20 7222 7100 or our UAE Representative Samer Al-Omari at samer.alomari@webuildiraq.org or +971552088000. Posted in AMEC Foster Wheeler, bank, Banking & Finance, Beas LLC, BP, Business, Capital Bank of Jordan, Citi, Citigroup, conferences, Construction & Engineering In Iraq, DUBAI, E&Y, Eversheds, Exxon, Exxon Mobil, ExxonMobil, featured, GardaWorld, GE, Gulftainer, Healthcare, Investment, Iraq Banking & Finance News, Iraq Britain Business Council (IBBC), Iraq Industry & Trade News, Iraq Middle Market Development Foundation (IMMDF), Iraq Oil & Gas News, Islamic International Bank, Mitsubishi, Restrata, Rolls-Royce, Serco, Shell, Siemens, SKA, Stephenson Horwood, United Arab Emirates (UAE), United Kingdom, Uruk, Weir Group. IBBC has been aware for many years of the important role that the UAE plays as a regional hub for business and trade through the MENA region and in particular as a regional base for companies and their families working in Iraq. The ease of doing business here, the major port of Jebal Ali and Dubai and Abu Dhabi airports with their world beating airlines and the large number of Free Zones where companies can base their off shore activities plus enterprising and caring leadership by generations of the leaders of the UAE, all have contributed to the global status that the UAE now enjoys. I extend my warmest thanks to the UAE Authorities for their support in allowing and promoting this conference, which we hope will become a permanent feature in IBBC’s annual calendar of events. The Department of Tourism and Commerce Marketing here in Dubai have been especially supportive. I also warmly welcome the record number of non-member delegates who are joining an IBBC event for the first time and I hope you will all use this opportunity to engage with existing members and the senior IBBC team represented here, to learn more about what we do and how we work with our members about promoting business in Iraq. For members, I do urge you to discover the products and services on offer from our new friends. Welcome to Delegates from Iraq. I wish to thank the Government of Iraq for its support of this conference and to extend a special welcome to HE Mr Kadhim Finjan AL Hamami, Minister of Transport. Mr Finjan a friend and supporter of IBBC. His genuine concern lies with the People of Iraq and the Basrawis in particular. Posted in Basra, Business, conferences, Construction & Engineering In Iraq, Dar Al-Handasah (Shair and Partners), DUBAI, featured, GE, Gulftainer, International Islamic Bank, International Monetary Fund (IMF), Investment, Iraq Banking & Finance News, Iraq Britain Business Council (IBBC), Iraq Industry & Trade News, Iraq Oil & Gas News, Khudairi, Marubeni-Itochu Steel, Pell Frischmann, Petronas, SKA, United Arab Emirates (UAE), Weir Group, World Bank, World Finance Corporation. The Iraq Britain Business Council (IBBC) will be holding its Spring Conference on April 27 at Mansion House and on April 28 at Vintners’ Hall in London. In recent weeks considerable political debate has taken place in Iraq following Prime Minister Abadi’s announcement of a technocrat reshuffle of his cabinet. It seems that the motto of the conference – ‘Iraq in Transition’ – fits what is happening in the country better than expected. Unfortunately, this means that previously announced Iraqi Ministerial attendance cannot be confirmed anymore. The Minister of Oil will not attend the conference having stepped down from his post recently. It is still planned for the Iraqi Minister of Industry and Minerals, HE.Mohammed Sahib Khalaf Al-Daraji to attend. The conference is the place to hear about the latest developments in Iraq from top level UK and Iraqi officials, businessmen and academics. Alderman Peter Estlin, the Lord Mayor’s Aldermanic Representative. They will be joined by speakers from IBBC member companies such as Shell; BP; Standard Chartered Bank; Gulftainer; Weir Group; Restrata; Management Partners; Moby Group; Bath Spa University and others. Baroness Nicholson of Winterbourne will be hosting a post-conference dinner for delegates at the historic Vintners’ Hall. Due to a large number of delegates registering for the conference, the second conference day venue is changing from Shell Centre to Vintners’ Hall. On both days delegates will enjoy the participation of a large delegation of Iraqi businessmen and regional officials representing most governorates of Iraq, led by the Chambers of Commerce. IBBC members Shell, Restrata and Al Iraqia for Money Transfer have generously agreed to sponsor the event. Please register via the online booking facility on the IBBC website, or contact the team on london@webuildiraq.org or +44 (0) 20 7222 7100 for advice and help. The IBBC team looks forward to seeing you at the Spring Conference! Posted in bank, Banking & Finance, Baroness Nicholson, Bath Spa University, BP, Business, Construction & Engineering In Iraq, featured, Federation of Iraqi Chambers of Commerce, Gulftainer, Investment, Iraq Banking & Finance News, Iraq Britain Business Council (IBBC), Iraq Industry & Trade News, Iraq Oil & Gas News, Management Partners, Moby Group, Newton Investments, Politics, Restrata, Security, Shell, Standard Chartered Bank, UK Export Finance Department, United Kingdom, Weir Group.